In the three years that I have overseen the CertTESOL course at Trinity College’s regional centre in Hong Kong, we have seen over 400 trainee teachers come through the centre. The comments that they have about the course, the trainers and the experience say a lot about the type of course that we run, and the way the the Trinity College CertTESOL helps new teachers enter into the industry as motivated professionals from the outset. Here are some of the most common feedback comments we have about what we do. There’s no getting away from it – the CertTESOL course is hard! As it is recognised as a level 5 qualification on the UK Registered Qualifications Framework (RQF), it is equal in level to the second year of an undergraduate degree course, all delivered in as little as 4 weeks! I have had trainees who have studied MBAs, PhDs and other higher degrees, who have said that it was the hardest 4 weeks of their lives. However, the intensity of the course, the sheer amount that you learn and put into practice, and the resulting bonds that emerge from the experience are irreplaceable. The rewards of gaining a lifelong professional qualification that can take you around the world, earning to live as you go, far outweigh the stress of the course, and 99% of trainees come away from the course with a great sense of satisfaction of having been part of an incredible journey. The rewards of high-level training like this don’t stop at the end of the course. The range of methodologies, knowledge and advice that trainers give will stay with you into your own teaching experience. A lot of teachers become frustrated or jaded about their classrooms, but with the reliable techniques that the course provides, you can make the most of your classroom work, keeping things progressive, fun and motivating for both you and your students. Doing things well, and delivering to a high standard takes work at first, but if you continue applying the routines we suggest on the CertTESOL course, your work will stay fresh and rewarding into the future. Another comment that we often receive from CertTESOL trainees is that the training team are supportive beyond the requirements of the course. We know that it can be a stressful and sometimes emotional experience, so we make sure that time is given to each trainee according to their needs, in order for them to achieve the best that they can from the course. Through tutorials, planning meetings and individual assignment support, it is rare that an issue goes unnoticed. The pass rate for the course of over 94% shows that everyone under our supervision gets the course done! This comment is from course trainees who have experience in the classroom prior to attending the course. They may have a national teaching qualification, or have taken another route into language education, and have been working in their own classrooms for a few years. Coming on to the CertTESOL course and learning new ways of teaching to the individual needs of the learners, applying language and teaching knowledge to ensure all-round learning takes place, many experienced teacher realise what was not happening in their classrooms previously. I had this experience myself, working untrained and unqualified on a university year in France. I had no idea what I was doing, other than what I was told to do day by day by the class’ main teacher, and when I came to do my own formal training in language teaching, the light bulbs went on and I realised what I should have been doing all these months. I always say that it made me a better teacher in the end. This is an important piece of feedback, and shows that the CertTESOL course does not stamp out teachers from a proscribed mould – due to the focus on reflective practice, trainees are encouraged to think about their own style of teaching, how they want to develop and the aspects of teaching that matter most to them in their own development. This creates a range of different teaching styles, all of which fulfil the basic principles of teaching and learning from the course, but in very different ways. This is important because of the diverse range of teaching settings where trainees go on to work. The CertTESOL qualifies you to teach in public schools, international schools, universities, working with young learners, adults and every age in between. The demands of the job are wide-ranging, as should be the skills that a good teacher can demonstrate, so this diversity of styles provides opportunities for employment in many sectors of the TESOL industry worldwide. Perhaps the most important realisation made by CertTESOL trainees is that the learners should always come first. A lot of teachers go into the job thinking it’s all about the way that you teach, what you do and how you act as a teacher that is the focus of the teaching profession. However, teaching is not learning; because language education is all about student practice, and the mount of time they have to try out new language in the class setting, the more you teach (and therefore dominate the interaction in the class), the less your learners actually take on from your classes. This is probably the biggest ‘lightbulb moment’ for course trainees both experienced and new to the field. 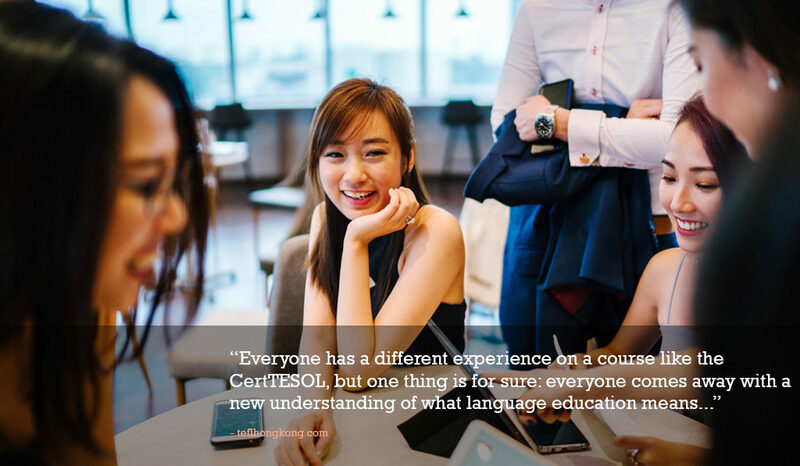 Overall, everyone has a different experience on a course like the CertTESOL, but one thing is for sure: everyone comes away with a new understanding of what language education means, and how we can do the best by our learners in different ways. This is the core of Initial Teacher Education qualifications of this calibre, and what makes CertTESOL trainees give the level of praise that they do in feedback on the course. Next Post Next post: Communicative language teaching with large classes – It’s possible!